View Source took place in the Radialsystem right in the center of Berlin. The venue was located next to the Spree, which is the river crossing Berlin. Having a cool drink next to the water enjoying the sun was definitely perfect to regain some power after listening to exciting talks. The conference itself was single tracked. I personally like this format, because I don’t have to worry about missing a good talk due to a competing schedule. There were enough breaks and lounge areas to easily socialize and hang around. Location- and organization-wise there was nothing to complain about. Good job folks! One of the highlights aside from the talks on the main stage were for sure Tim Pietrusky and Ruth John. 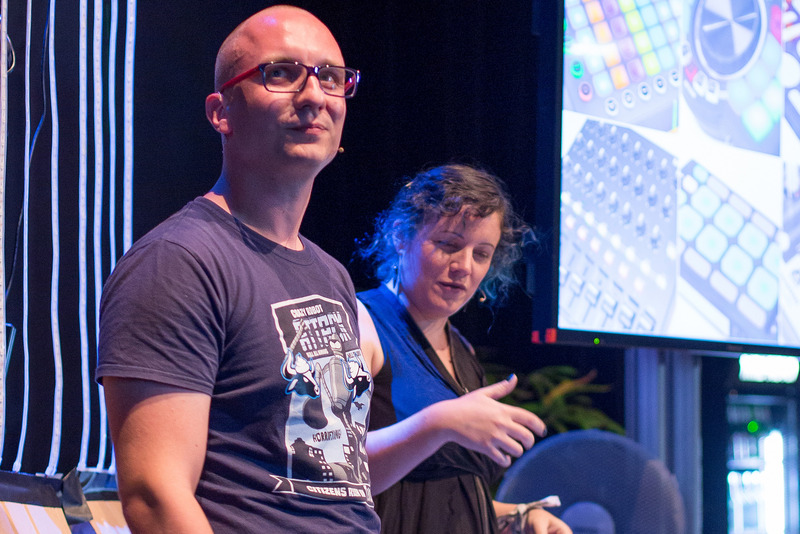 They performed a demo connecting MIDI devices to a browser to make music and visualize the sounds via several LED strips. Definitely a great showcase of what browsers are able to do these days. So, when you’ve got the chance to see Tim or Ruth (or both) performing, it’s definitely worth it. Generally speaking the level of the talks was really solid. The topics went from new technology, over accessibility to current best practices. If you want to see more talks aside the three I have recommended, make sure to check all the videos at the Mozilla Hack Youtube Channel. Another really important thing I want to point out is, that all talks at View Source conf were live captioned. It’s something I haven’t seen at many conferences and definitely we should consider it in order to make the events we love more accessible and welcoming places. Lena Reinhard quickly became one of my favourite keynote speakers. Her “Talk About Nothing” went around the world because it was emotional, touching and eye opening. She continues giving exceptional talks that make a difference. Her presentations deal with diversity, depression and general problems we have in our industry. Watch it and open your eyes! What does it take to create a web that can deal with its own progress? What does it take to build browsers that are compatible with websites built 5 years ago? What does it take to write specs that are compatible with the mistakes people did ages ago? Mike Taylor presents in a really funny and entertaining way what it takes exactly to make the web compatible with its own progress. And he does this by showing not well known facts and hacks. When watching his talk be aware — attending this talk made me feel uncomfortable and you might feel like that, too. Don’t worry about it, nothing bad happens. This talk is definitely one of my highlights of this conference season. I’ll definitely go again — see you next year! I really enjoyed being at the View Source conference and if anyone would ask me if I would go again my answer would be a clear “Hell Yeah”. So thanks to the organizers, speakers and participants for having a great time.